I often like to read books about places I have visited. So, after my amazing trip there last year, I was on the look out for a book set in Nepal. It was the colourful front cover that first attracted me to Little Princes, and the fact that the story sounded uplifting. Finishing the final pages of Little Princes while sipping ‘milk tea’ which I bought on a souvenir shopping spree in Kathmandu, I felt a real craving to go back and explore more of Nepal. Closing my eyes, the spicy aroma from my mug made the dusty streets of Kathmandu seem not too far away. I was never really out of my comfort zone in my brief two week visit to Nepal, but Conor Grennan certainly was. 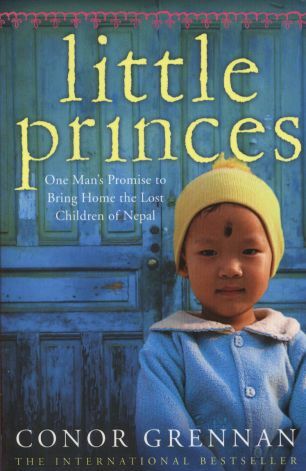 Little Princes is his story about how he came to be in Nepal in the first place and how it changed not only his life, but the lives of countless Nepali families. At a crossroads in his life, Conor Grennan decides to take a year out to travel the world. To justify his trip, he plans a three month stint of volunteering in an orphanage in Nepal. Grennan is the first to admit that he saw this as a way to impress people and I admire his honesty. But the Conor at the beginning of the book is very different from the one at the end. His time at the Little Princes orphanage made a lasting impression on him. Anyone who has looked after children will appreciate Grennan’s stories about the orphanage. Working with children is never dull and neither are Grennan’s descriptions of life at Little Princes; the daily routines, the children’s personalities, his developing relationship with them. However, I did find the book slow at first, mostly because there was a lot of unnecessary talk about his life before Nepal and the rest of his year out. As the book goes on, we learn more about why the children are at Little Princes. As in orphanages all over Kathmandu, most of these children were not actually orphans at all. They had been taken from their homes by child traffickers. Families in remote villages paid money that they could hardly afford to send their children away to be safe from the Maoist army. They believed their children would be looked after, educated and would return when all was safe. In reality, these children were sold as slaves, forced to beg for money, or simply dumped on the busy streets of Kathmandu. It’s hard to peel your eyes away from the pages as Grennan becomes more involved in the heartbreaking stories of these children, trying desperately to come up with a way to help them. The book is full of ups and downs as we follow him through the ramshackle streets of Kathmandu and up dangerous mountain paths as he tries to fulfil his promise of reuniting the lost children with their families. Although parts of the book were not always to my taste, overall I would recommend Little Princes. There are short and simple explanations of the history of the political situation in Nepal throughout, which keep the reader informed but not over burdened with complicated facts. It feels as though the writing comes from the heart – Grennan really cared for the children, and his many anecdotes show just how resilient kids can be, even after unimaginable horrors. To raise funds and make all of this possible, Conor Grennan founded the nonprofit organisation, Next Generation Nepal. Visit the website to find out more about what they do.